Luna Bay is an infill residential property development that national builder D.R. Horton initiated off Honore Avenue in south Sarasota County in 2015. This community was developed soon after the completion of nearby Ashton Pointe, another D.R. Horton housing project a few blocks southeast of the junction of Honore Avenue and Ashton Road. Set for just 21 single family homes, Luna Bay sits on a five-acre parcel directly adjacent south of a similar infill development, Provence by custom builder Neal Signature Homes. 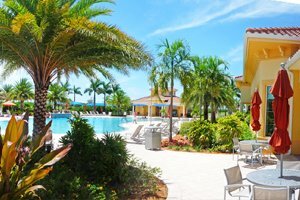 Magnolia Pond and Three Oaks, older developments which are also “bedroom communities” with exciting selections of Sarasota homes for sale, are Luna Bay’s neighbors towards east. Colony Groves, also a well-established community, is just south of this D.R. Horton development. 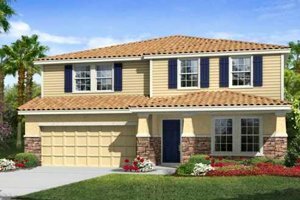 In the wake of the housing recovery after the Great Recession, homebuilders have been actively combing these communities’ south Sarasota area for developable parcels. This locality is of particular interest to builders and home buyers alike because of the major road corridors in its periphery which include Interstate 75 only about a mile east of Luna Bay. D.R. Horton dug deep into its decades of industry experience to make Luna Bay homes for sale stand out in the Sarasota real estate market. This Texas-based builder developed the community as a private, gated enclave with its residences lined along a single interior street and built on lots of over 9,000 square feet. Street lamps, underground utilities and the Mediterranean architectural style of its homes provide a stately charm to this small community. Luna Bay homes for sale are of one or two-story designs with floor areas of between 1,800 and 3,200 square feet built with three to four bedrooms. The largest amongst these residences could be configured as a five-bedroom residence suited for a multi-generation household. 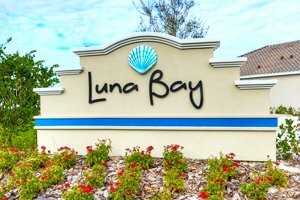 Impressive in their tile roofs and brick-pavered driveways, the homes of Luna Bay are typically sales-listed from the mid-$300s up to the $400s. The interiors of these residences spell class with their cathedral ceilings, oversized master bedrooms and gourmet kitchens. Screened lanais and landscaped private backyards provide added zip to the homes for sale in Luna Bay. Exterior maintenance is included in the purchase of a residence in this community, allowing its residents plenty of time to indulge in life and leisure activities at the lifestyle hubs that abound around Luna Bay. A commercial center, Palmer Crossing Circle, is just a few minutes’ drive south of the community and offers a selection of retail chains and dining places. Similar short trips westward on Clark Road lead not only to other commercial hubs but also to the Stickney Point gateway to the pristine beaches of Siesta Key. Eastward on Clark Road brings Luna Bay residents to the interchange at Interstate 75 that leads north to various points of interest including commercial and business centers. Proximity to topnotch schools and health care service providers likewise help sell Luna Bay residences. Sarasota Middle School and Ashton Elementary are both a short distance from this community. As comforting for parents, Sarasota Memorial has set up a health care center nearby at Clark Road with childcare services amongst its areas of specialization. Below are the current real estate listings available at Luna Bay.